This is just a FYI that there is a cool little project that provides XPath like support for JSON values: JSONPath Plus. I think this is rather cool as XPath is probably the only nice thing about XML over JSON. If you’ve never heard of XPath, you can think of it as a query language for filtering/parsing XML data. Everything from getting a subset of an XML document to even doing things like addition. If you’d like to learn more, check out the MDN documentation on XPath. 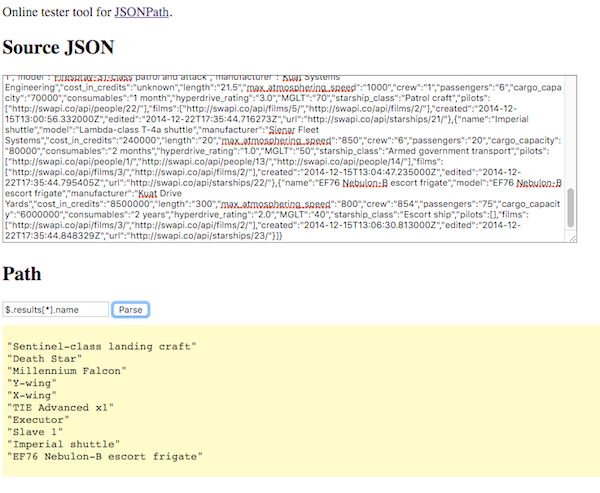 JSON doesn’t provide any similar functionality built-in, but JSONPath provides an alternative. Here is an example of it in action. Let’s take the result of calling the Ships API from the Star Wars API. 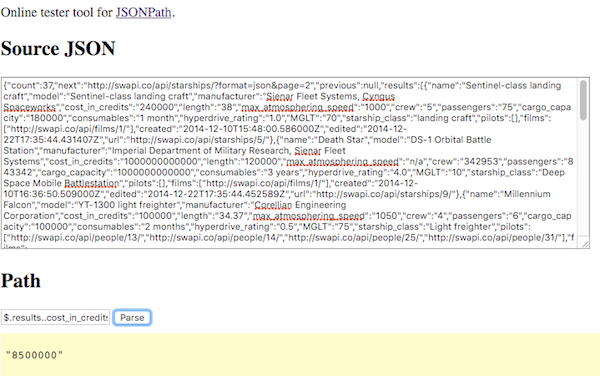 The URL for this JSON is http://swapi.co/api/starships/?format=json. Here is the result - with some of the results taken out just to make the snippet a bit smaller. Just by eyeballing that* you can see the object contains a count key, a next and previous set of keys for pagination, and a results array. Using JSONPath, I can request just the result by using this path: $.results. Or I could ask for the total sum of the cost values like so: $.results..cost_in_credits. While JSONPath itself has a few configuration options, my tool simply takes the defaults. You can paste in a JSON string and then play around with the path options to see the results. My code isn’t anything special here - basically take in the inputs and render them out. I’ll remind folks that JSON.stringify lets you pass in basic formatting instructions. That’s how I got the nicely layout dump of the data. You can try out the demo here: https://static.raymondcamden.com/demos/2016/03/15/. * As a quick aside, I’ve been using this online JSON viewer for a while now to render complex JSON objects. I need to build an extension for Visual Studio Code so I can use this in my editor.